Sheldon Lawrence lands a punch during a training session at the boxing gym at the Hasely Crawford Stadium, Mucurapo, yesterday. TOP LOCAL professional boxer Sheldon Lawrence has secured a World Boxing Council (WBC) light heavyweight bout with Russia-born German Serge Michel in Germany, on October 6. 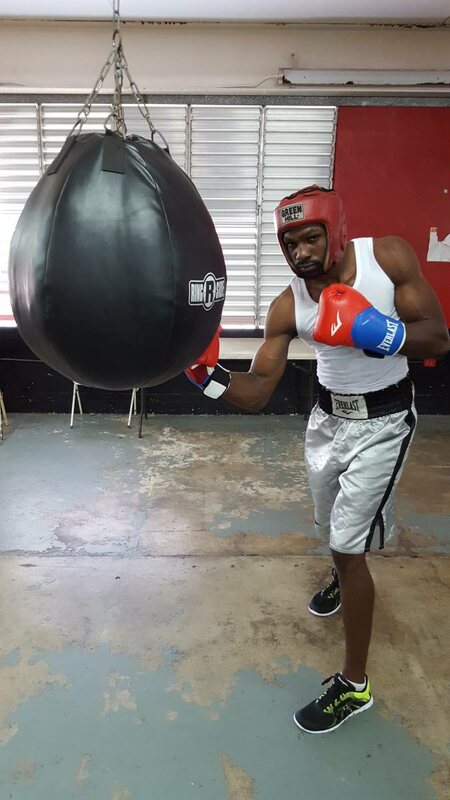 Lawrence’s manager/promoter Boxu Potts has indicated that funding and preparation must be accelerated to ensure that the 30-year-old moves one step closer to a world light heavyweight title fight against current FECARBOX (Caribbean and Central American) champion Israel Dufus of Panama. Lawrence, recently stripped of his WBC FECARBOX light heavyweight championship belt for failing to defend his title within the stipulated six-month period last month, will also need to dedicate himself completely to his training over the next five weeks. Lawrence already has a fight against Venezuela’s Antonio Mercado in Caracas on Friday. But plans for the top local pugilist have to be fast-tracked given the short period leading up to the WBC bout against the German, dubbed the “Bavarian Sniper”, who has a record of 7-0 with five knockouts. Due to a lack of funding, Lawrence has been inactive owing to family and work commitments – he is employed at an oil-rig. If he defeats Michel, Lawrence will be eligible for a bout for the WBC title fight against current FECARBOX champion, Israel Dufus of Panama. Potts again called on the Ministry of Sport and Youth Affairs to follow their policy of funding this country’s top athletes. Reply to "Lawrence to face German in WBC bout"